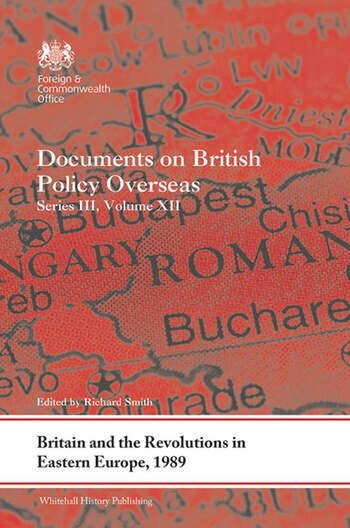 This volume documents the UK Government’s response to the unfolding social and political changes in Eastern Europe during 1989. The year 1989 saw momentous change in Europe. It was the year in which Communist rule in Eastern Europe finally ended: with mass demonstrations, an end to one-Party rule, free elections and the opening of borders. In Poland, the independent trade union Solidarity went from being an illegal organisation to running the country. Vaclav Havel went from being a jailed dissident to President of Czechoslovakia. In October 1989, the German Democratic Republic marked the 40th anniversary of the Socialist state, only to see that state collapse a month later following the opening of the Berlin Wall. In December, the Romanian leader Nicolae Ceauşescu saw his near quarter century rule brought to an end in a matter of days. This volume charts the events of an historic year in Bulgaria, Czechoslovakia, the GDR, Hungary, Poland and Romania, and looks at British policy towards the Baltic States. It contains reporting from British embassies on the rapidly changing political scene, and documents attempts by the British Government to develop policy against the backdrop of unfolding revolution. This book will be of interest to students of British politics, Eastern European politics, and International Relations. Richard Smith is Senior Historian at the Foreign and Commonwealth Office, London, UK.